Impaling clips are a quick and easy way to install fiberglass or mineral wool boards to a wall. Each clip measures 2-1/8" x 1-1/2" and has eight spikes to impale the back of a panel to hold it in place. Impaling spikes on the clip are about 3/4" deep. Construction adhesive, such as Liquid Nails, is recommended to ensure a secure panel installation when using impaling clips. 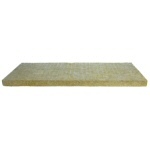 4 to 6 clips are recommended per 24"x48" piece of acoustic insulation. 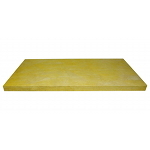 For panel applications requiring an air gap, wood spacer blocks can be installed between the impaling clips and the drywall to keep the panel spaced off the wall. These clips are not for hanging ATS Acoustic Panels (see our Professional Installation Kits for that type of application). These anchors are for hanging fiberglass and mineral wool insulation boards, as mentioned above. Price is for a pack of 4 clips. 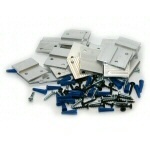 Each pack includes 4 screws and 4 conical anchors. Alternative installation materials? Bulk quantities? You name it! Just give us a call toll-free at 1-866-787-7881. Panels are up at Dms12 New Digital Style Studios. Big thanks ATS Acoustics for such a great product! 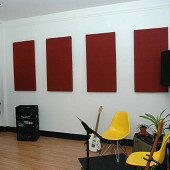 DIY Panels at Octopus Music School. Made with Owens Corning 703 and original burlap fabric.